I love jazz... but don't listen to it as much as I used to. I think my listening patterns are cyclical. Wynton Marsalis needs no introduction... he is *the* jazz trumpeter of now... at least the *big band* trumpeter of now. His work is very visual with a wonderful sense of movement... with such graciousness and elegance. "Here…Now., is a ballet choreographed by Judith Jamison for the Alvin Ailey American Dance Theater. The piece is dedicated to and inspired by the triple Gold medalist at the 1988 Olympics, runner Florence Griffith Joyner, “Flojo”, who died of an epileptic seizure at the age of 38. 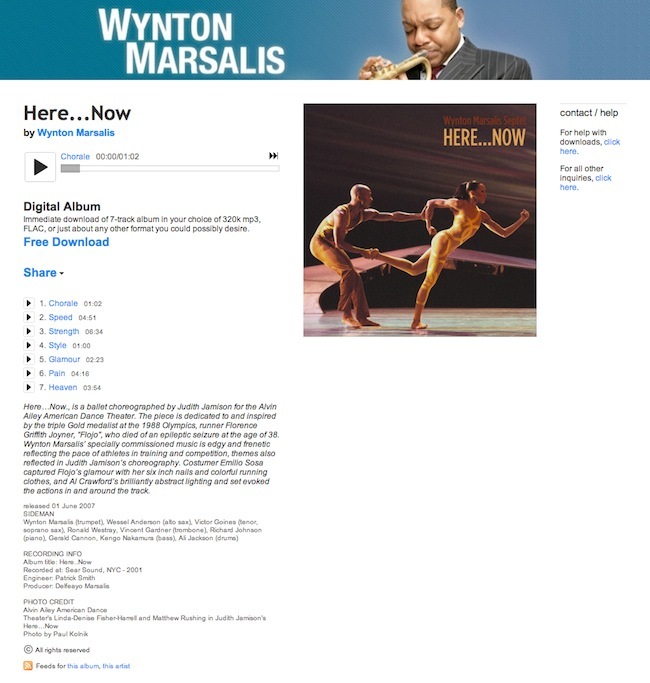 Wynton Marsalis’ specially commissioned music is edgy and frenetic reflecting the pace of athletes in training and competition, themes also reflected in Judith Jamison’s choreography. Costumer Emilio Sosa captured Flojo’s glamour with her six inch nails and colorful running clothes, and Al Crawford’s brilliantly abstract lighting and set evoked the actions in and around the track." "Marshall" by lowercase noises is an amazing collection of instrumental post-rock soundscapes created by Andy Othling. I found this album to be particularly moving... especially the last track - "how deep the father's love" - which is a favourite hymn of mine... and is wonderfully yet faithfully reimagined. To come at the end is so climatic ... it had me in tears... and then had me playing it on repeat. 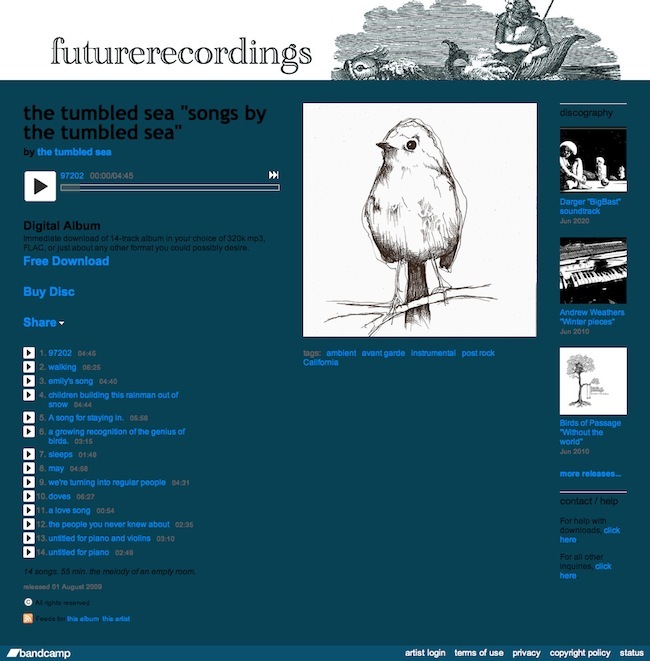 "the tumbled sea songs by the tumbled sea is more instrumental post-rock... but with a greater emphasis on piano-based soundscapes. Wonderfully atmospheric and engaging. Reminiscent of Sigur Ros... but not as grandiose. Subtle synths and rainfall make this very relaxing... this is very much "the melody of an empty room". "8 song masterpiece of hazy noisy ambient soundtrack orchestrated beauty in pill form." ... I tend to listen. 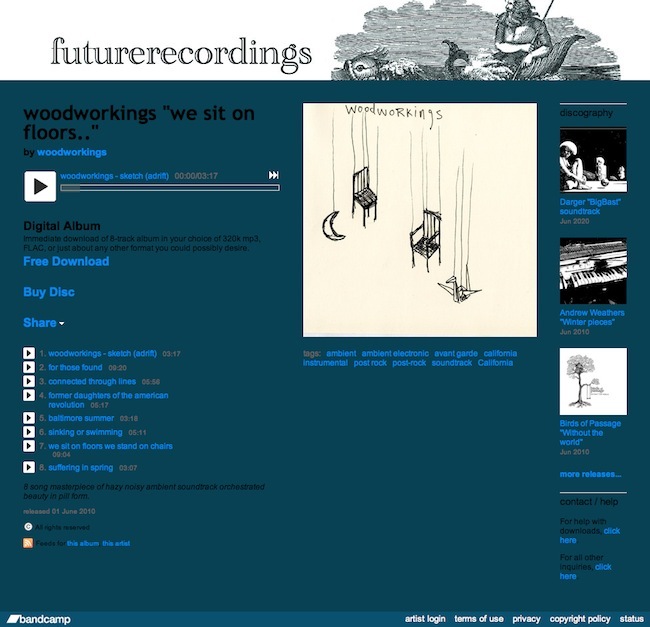 I found the listening to "we sit on floors" by Woodworkings very rewarding... because it filled my days with luscious orchestral instrumentation and engaging organic ambient soundscapes. This music is the aural equivalent of coffee on the maker... whose essence permeates the house when on. 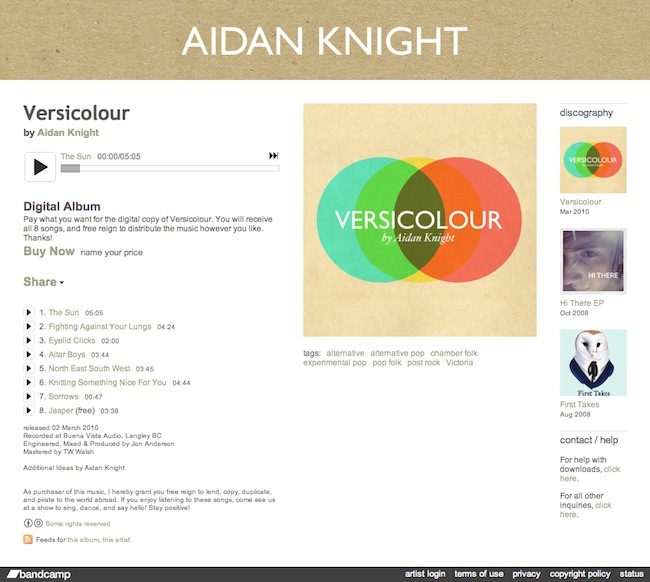 "Versicolour" by Aidan Knight has more of an indie vocal vibe over an orchestral folk & post-rock backing. Powerful & climatic... intimate & tender... with some subtle glockenspiel action in there to make me extra happy. Lovely! Please check out these artists and directly support truly wonderful independent music.